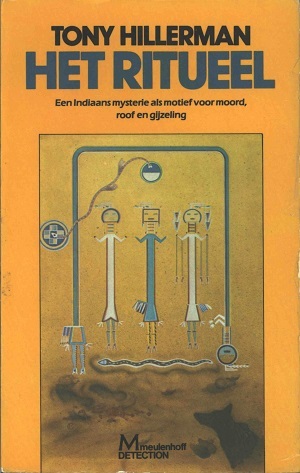 This is the 1979 Dutch edition of Listening Woman. Tony Hillerman's novel is translated from English into Dutch by Rob van der Veer. The title, Het ritueel, which translates as "the ritual," is also the title of a 1969 Ingmar Bergman film known in English as The Rite. The cover includes reproductions of a Navajo sandpainting, footprints in the sand, and the silhouette of a dog. Format: Paperback, 19 x 12 cm. Binding: Pasteboard in orange, with black and turquoise text on spine and front and back covers, plus a full-color graphic inset.